Combining out-of-home and hyper-local mobile targeting, xAd today announced a first-of-its-kind converged media offering, co-developed with out-of-home (OOH) communications agency Posterscope. The cooperative solution leverages consumers’ real-world movement and in-market visitation patterns to determine the optimal time and place where brand communications are most likely to influence on- and offline consumer actions. Harnessing the value of big data, xAd’s targeting technology (SmartFencing™) identifies users who have recently been exposed to Posterscope’s OOH placements and then re-targets them throughout their day with dynamic, behaviorally triggered ads in an effort to ensure the brand is easily accessible when it matters most. Through xAd’s Store Visitation Lift (SVL) measurement product – actual in-store visitations post-OOH and mobile ad exposure will be tracked, providing Posterscope a way to effectively close the loop and provide a true measurement on campaign performance and ROI. This combination of OOH and location-based mobile advertising creates a powerful marketing tool for advertisers who can now turn targeted awareness into immediate actions and measurable results. 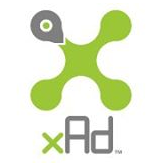 Founded in 2009, xAd is one of the largest mobile advertising platforms in the U.S. and the leader in delivering targeted mobile ads based on accurate user location and search context. Across its network, the company aggregates and manages billions of monthly ad impressions from which it derives the largest supply of location-based advertising inventory in the market. xAd delivers targeted mobile location@scale for over a million national and local advertisers, including brands like Pinkberry, Home Depot and Wells Fargo. xAd is based in New York City with several satellite offices across the U.S. and internationally. For more information, visit http://www.xAd.com. Posterscope is the world’s leading out-of-home communications agency. It knows more about how consumers behave when they are out of home than anyone else. Posterscope understands the connection between OOH, mobile and digital, and pioneers trials to understand how consumers will use emerging technologies. Posterscope has 48 offices around the world, buying over $2.1bn of out-of-home advertising space each year. Posterscope group agencies include international agency PSI, and brand experience agency psLIVE.